The Japanese novelist Natsume Sōseki once surmised his feelings about bathrooms as ‘a physiological delight.’ These often-disregarded spaces should be spaces in which we delight—they offer some of our only moments of solitude, composure, and the opportunity for renewal. 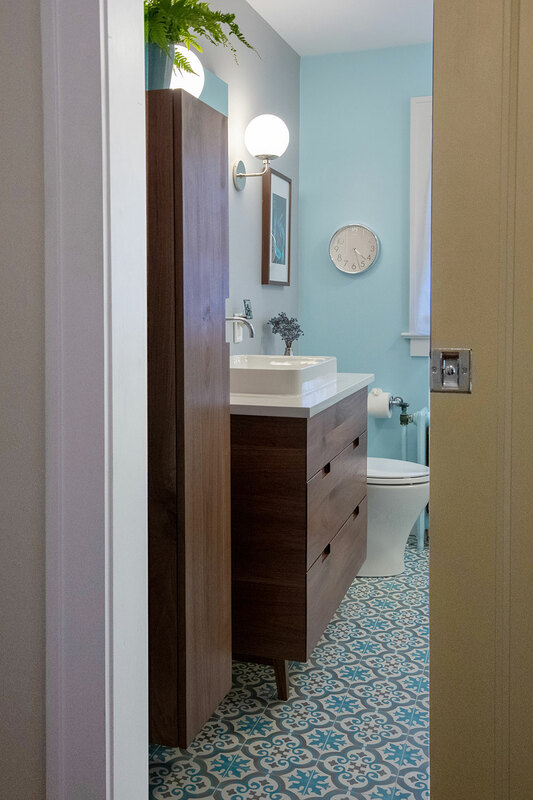 When the owner decided to update their narrow bathroom, which dates back to 1922, the hope was to create a functional space with a mid-century aesthetic. To open up this slender space, a pocket door took the place of its original. Further, a custom vanity and vertical cabinet were built by David Wing, allowing for more spaciousness once inside. The pieces are made from a dark wood with bold grain patterns, which wrap perfectly from side to front. This new storage solution allows for clear counters—it even features a hidden outlet for electric toothbrushes. Inset handles round out the overall feel of mid-century simplicity and unobtrusiveness. Building on the classic structure set by these furnishing comes playfulness through color and pattern. The far wall and radiator pull a bright and airy blue from the styled cement floor tiles. To the right lies the soaking tub, a feature which makes this bathroom a space a true relaxation. Subway tile lends an overall crispness to the bathing space, with a small pop of color coming through the inlaid shower shelf. Sconces replace traditional recessed lighting, given the whole space a warmer and softer glow without compromising light quality. The comprehensive whole of the bathroom is a space of both productivity and leisure.